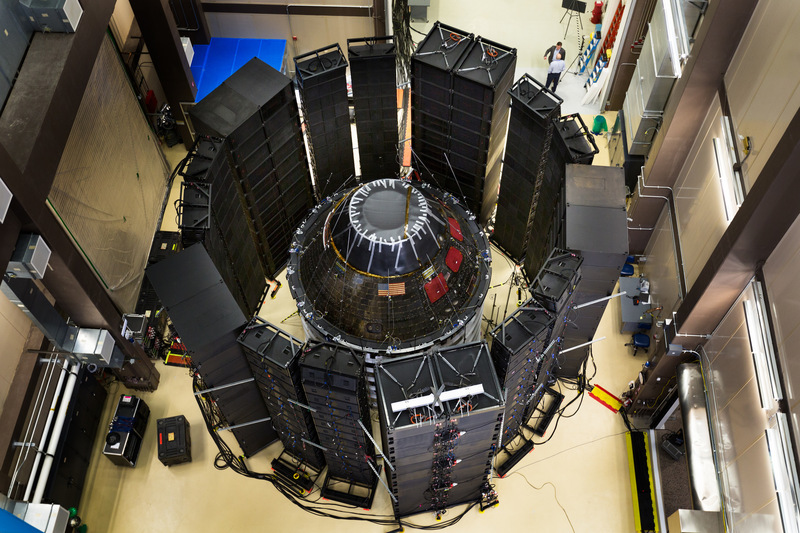 The two modules that will fly NASA’s first solo Orion flight into lunar orbit and back are going through standalone testing in the lead up to becoming a mated spacecraft. The Crew and Service Modules for the Exploration Mission-1 (EM-1) flight are being assembled and tested by Orion prime contractor Lockheed Martin in the Operations and Checkout (O&C) Building at the Kennedy Space Center (KSC) in Florida. The integrated Service Module joining the European Service Module (ESM) with the Crew Module Adapter (CMA) was powered up as a unit for the first time on February 14 to begin a last set of tests before it is ready to mate with the Crew Module. The last pieces due for the Crew Module arrived and are installed, so it can finish its pre-mate testing. Once the modules are mated to form the in-flight EM-1 Orion, several weeks of pre-launch closeouts will also serve to get the spacecraft ready for space environment tests at Plum Brook Station in Ohio later this year. For this round of testing, the Service Module is connected to ground support equipment that provides services from currently unconnected systems inside and outside the SM. “We have a full suite of what we call electrical ground support equipment, EGSE, and we have I call them racks, they’re large cabinets full of different electronics and they represent different elements of the system, both on the ground side and the CM (Crew Module) side,” Schneider said. 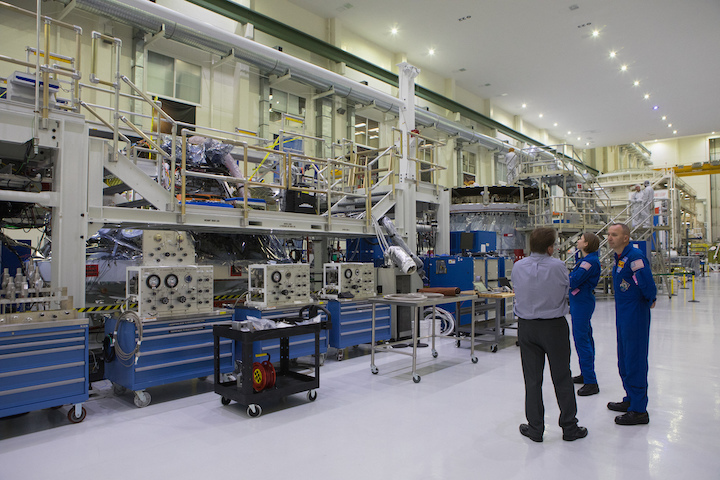 Prime contractor Lockheed Martin assembles and tests Orion vehicles in the O&C Building for launch. 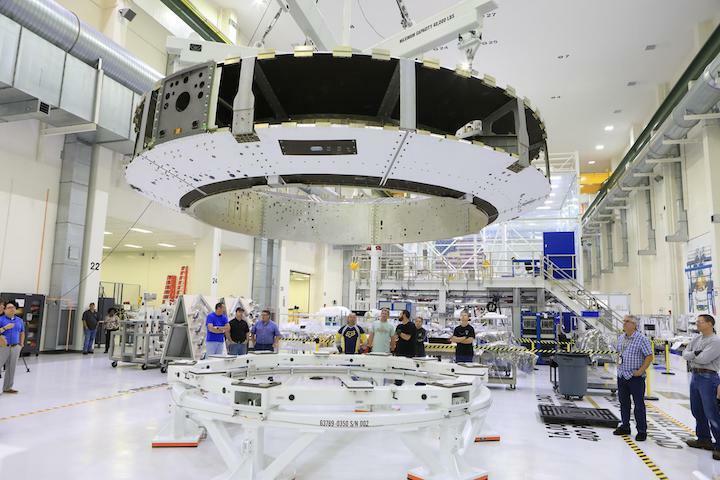 The Crew Module and Crew Module Adapter elements are delivered as bare structures that Lockheed Martin assembles and integrates into working spacecraft modules. 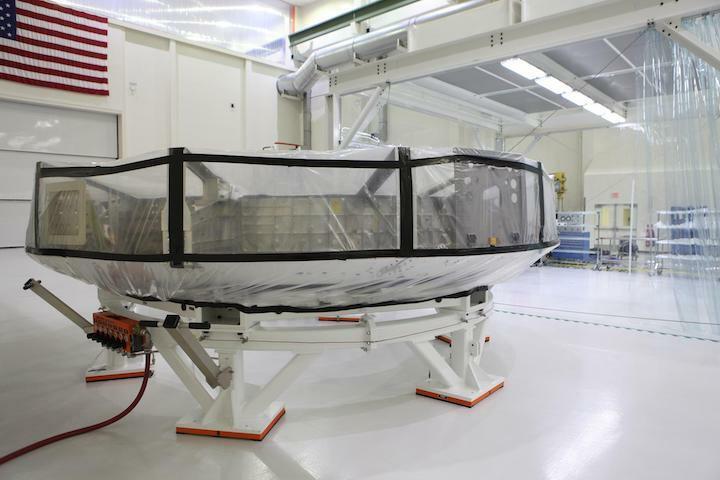 The ESM is assembled and integrated by Airbus Defence and Space in Bremen, Germany. Arrival in Florida starts final assembly of the three elements; once complete, the spacecraft is turned over to NASA at KSC for launch processing on-site. The EM-1 mission is the second test mission in a three-flight development sequence as a part of the Orion Program’s Design, Development, Test and Evaluation (DDT&E). The Crew Module was the only working version that flew on the first Orion test flight, Exploration Flight Test-1 (EFT-1) in December, 2014, where it flew most of the four-hour mission attached to a passive, mass simulator of the Service Module and the upper stage of the Delta 4 Heavy launch vehicle. This second flight spacecraft adds a working Service Module; the first flight ESM and CMA enables Orion to fly solo for the first time. The flight plan for Orion on EM-1 is to enter a Distant Retrograde Orbit (DRO) of the Moon on a flight that should last at least four weeks, maybe longer. The ESM, Flight Model-1, arrived at KSC in early November, kicking off a dense, year-long schedule of work to get the EM-1 Orion vehicle ready to handover to NASA’s Exploration Ground Systems (EGS) for launch preparations. A week after its November 8 arrival, the ESM and CMA were mated in the lift station, one of several work areas in the O&C Building for processing Orion hardware. The welds were X-rayed after they were performed and then again after proof test. “The first ones you do are looking to make sure you’ve got a good weld,” Schneider said. “Yeah, you don’t have any porosity or concavity,” Wilson added. Following the proof test and post-proof NDE, the module was taken back to the lift station to close out all the inside connections. “We went back into the lift station primarily because the lift station gives us really good access,” Schneider noted. One of those was installing some additional components on the CMA part of the Service Module. 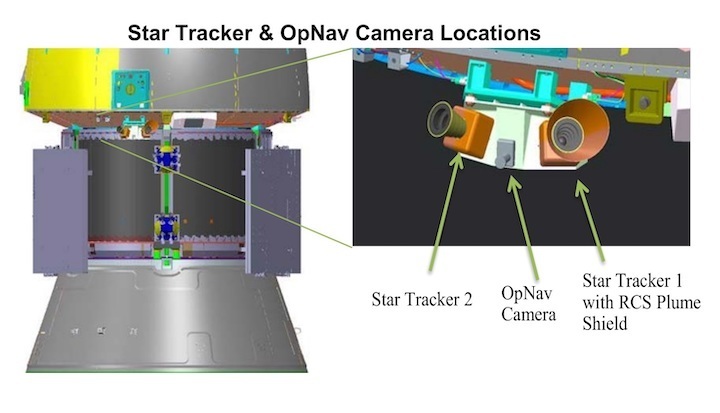 “There’s a couple of phased-array antennas that hang on the aft walls of the CMA and then the star trackers and the OpNav (Optical Navigation) camera are part of an assembly we call the ‘optical bench’ and that hangs off of the aft end of the aft walls of the CMA, as well,” Schneider said. Schneider and Wilson provided an overview of the intricacies of some of the MLI and heater close outs the team completed in the lift station. “There’s a lot of insulation that once you finish all those harness routings and component installations, there’s MLI that gets over the top of them,” Wilson said. “And you know once you close things out like that for flight you got to take a bunch of pictures and document all that stuff,” Schneider added. “The other part that’s been a lot of work, too, has been up on the top part of the Service Module and the top part of the CMA, is heater closeouts and heater installations,” Wilson also noted. “So it’s kind of tedious and difficult work and then you’ve got to wrap all the heaters with special tape and it’s…painful,” he added. The module was then moved to the Avionics, Power and Wiring Station in early February for IPO and functional testing. 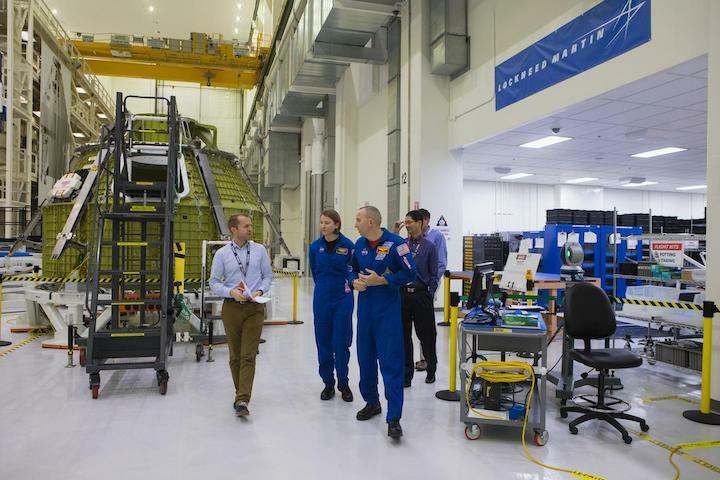 NASA and Lockheed have been building the American modules in the O&C Building for a while, but the team performing this first Service Module integration brought together both NASA, the European Space Agency (ESA), and their respective contractors. Once functional testing is complete, the Service Module will have two more standalone tests. The first is a thermal cycle test. In addition to all the operational wiring and sensors packing into the spacecraft, this first working Service Module has a significant amount of development flight instrumentation (DFI) installed. “DFI is probably one of the biggest challenges we have, there’s so much of it,” Schneider said. A qualification model solar array wing is test deployed while attached to the Service Module structural test article (STA) in February, 2016, at the Space Power Facility (SPF) at NASA Glenn’s Plum Brook Station in Ohio. Credit: NASA. “One of the other challenges with DFI is you usually don’t quite know where to put it until all the other systems are fully designed so it’s typically one of the last things to be designed and so that’s always a challenge you know when you’re trying to put those systems in, and kind of find the right places for them in the end,” Wilson added. There’s even more instrumentation for ground tests like the thermal cycle test. “So you have GTI, which is ground test instrumentation, which is instrumentation that you need to get data during these tests. It’s not going to fly, so most of it comes off before we fly but some of the GTI is buried so you can’t get it off,” Schneider noted. 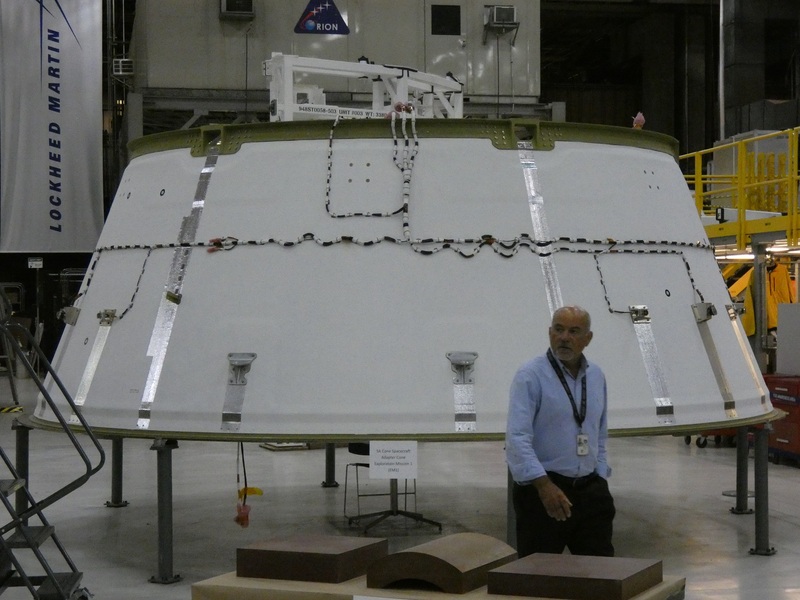 The EM-1 Orion spacecraft adapter cone in August, 2018, at the Michoud Assembly Facility in New Orleans. The adapter will be temporarily installed on the bottom of the Service Module for the upcoming direct field acoustic test (DFAT). It will be reinstalled in the O&C by Lockheed Martin before the spacecraft is handed over to Exploration Ground Systems for launch processing next year. Credit: Philip Sloss for NSF/L2. Following the thermal cycle test, the Service Module will be reconfigured for a direct field acoustic test (DFAT). For this ‘integrate and test’ cycle, most of the remaining, large appendages will be attached including the four solar array wings. “I think the biggest scope yet to go with the ESM is the solar array integration, that’s a huge amount of work and they’re not on yet,” Schneider said. “The Dutch Airbus guys show up, you know those are the guys that build it, they do a manual deploy just to check for damage during shipment and we do a soft-mate to the Service Module and do a deployment that way, driven by the spacecraft, and then we actually physically install them after we do that second deployment test.” In addition, the nozzle for the OMS-E engine and the spacecraft adapter (SA) will be installed at the base of the ESM for the DFAT. The test will validate that the working, integrated module handles high-noise levels within requirements and remains healthy. The solar array wings and the spacecraft adapter are then removed and the Service Module is prepared for mating to the Crew Module. The OMS nozzle will remain on the spacecraft. While the Service Module integration and test activities were going on, a couple of remaining major components for the EM-1 Crew Module arrived recently and were installed. At the time the ESM arrived at KSC in November, a few of the CM avionics boxes were still being reworked and the first working side hatch was due from its vendor. The EM-1 Crew Module in the O&C Building in November, 2018, prior to installation of the side hatch. The EM-1 vehicle will fly the first working hatch versus one bolted into place. Credit: NASA/Rad Sinyak. 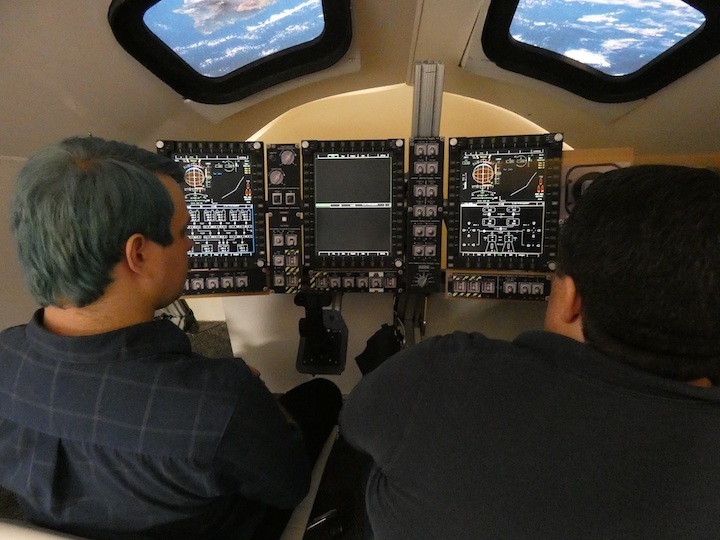 “All the avionics are back in, we’ve actually done all of the regression testing associated with putting them back in, we’re finished with that,” Schneider noted. “We’re integrating the hatch as we speak, the side hatch integration should be complete next week,” he added. The Crew Module was largely outfitted with those exceptions. Functional testing and a thermal cycle test were completed by the end of 2017 over a year ago and the heatshield was installed last summer. While waiting for ESM arrival and Service Module integration, issues with a few systems such as a few avionics boxes were addressed. Now that all of the components are on-site, the Crew Module is being prepared for its last standalone test. “The Crew Module goes through a direct field acoustic test as well, it’s already been through its thermal cycle test,” Schneider noted. 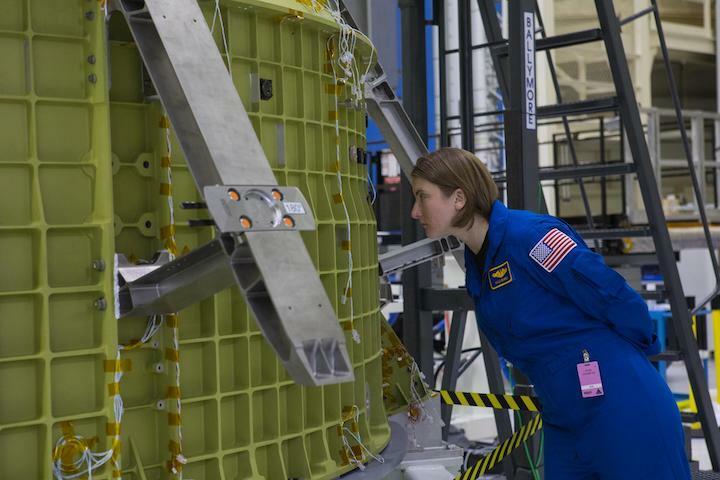 The EFT-1 Crew Module inside a portable acoustic test configuration in a Lockheed Martin lab in Waterton, Colorado. 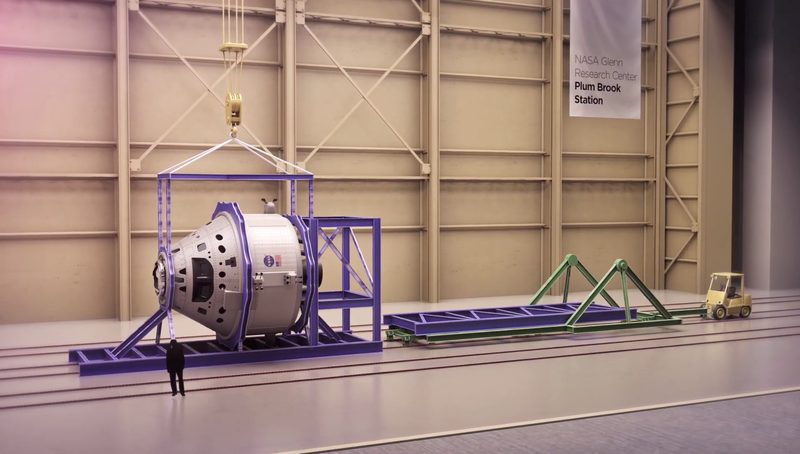 A similar set up will be used for direct field acoustic tests (DFAT) of the Crew and Service Modules in the O&C Building at KSC. Credit: Dusty Volkel/Lockheed Martin. Another one of those cats and dogs is to install the docking hatch plate. 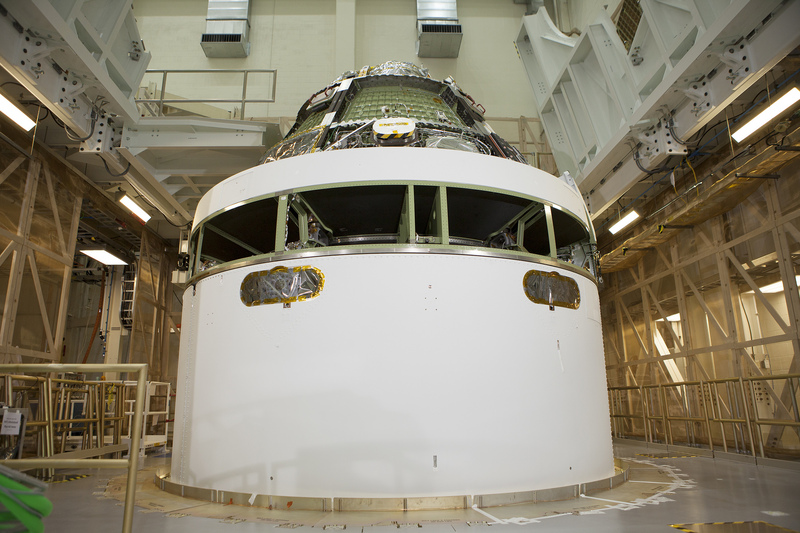 After the DFAT is complete, the Crew Module will be prepared for mating to the Service Module. A silicone-oxide coated aluminum kapton tape to prevent electrostatic discharge will be applied to the thermal protection system tiles on the backshell panels. For the EFT-1 flight, the tape covered the heatshield but not the backshell tiles. One panel was recently taped to verify the first-time application procedures, but the remainder will be covered after the DFAT. Once the remaining standalone tests are complete, the modules will be mated at the far end of the O&C Building. “The cell in the building that we do that work in we call the FAST (Final Assembly System Test) cell and the schedule has us in there for about eight weeks doing the CM to SM mate, but it’s not just the mate,” Schneider said. The Service Module will be moved into the cell and then the Crew Module will be brought over and lifted on top on to join the two. “By the way, it’s the same exact location that the Apollo program used to stack the Command Module and their Service Module and a couple of the other elements that they used,” he noted. 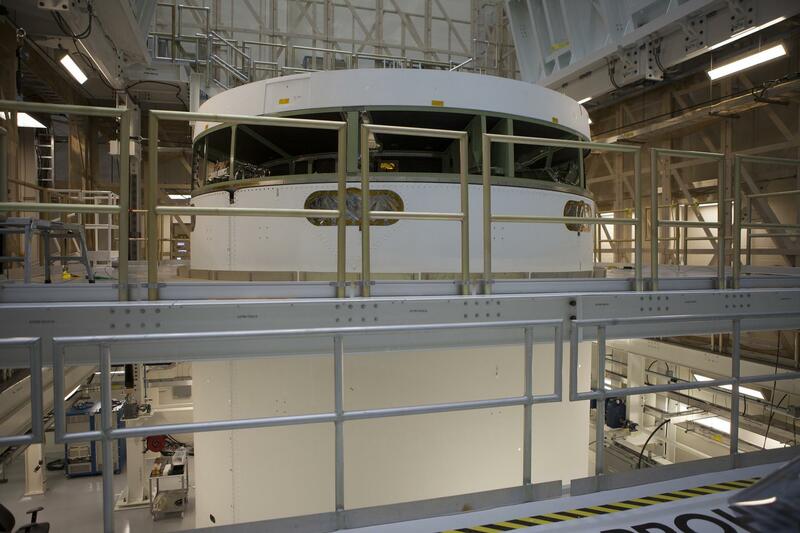 The EFT-1 Service Module simulator loaded in the FAST cell in June, 2014. The EM-1 Service Module will be moved here for mating to the Crew Module after completing its standalone testing. Credit: NASA/Glenn Benson. 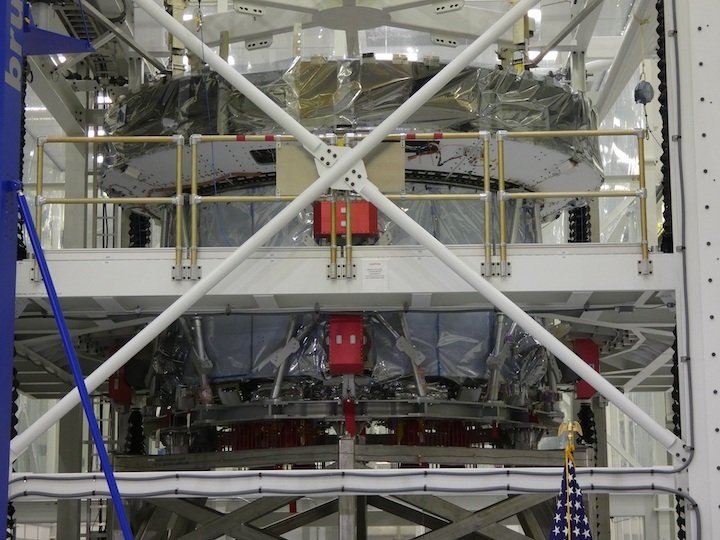 As Schneider observed earlier, the spacecraft is often being configured for its next set of tests, which will be a series at Plum Brook Station in Ohio later this year. 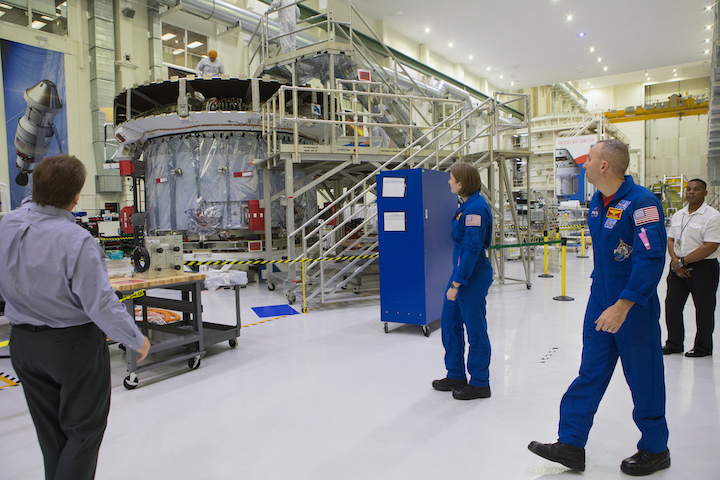 In this case, getting the combined Crew and Service Module (CSM) ready for the space environment tests at Plum Brook will also configure some parts of the spacecraft for launch. 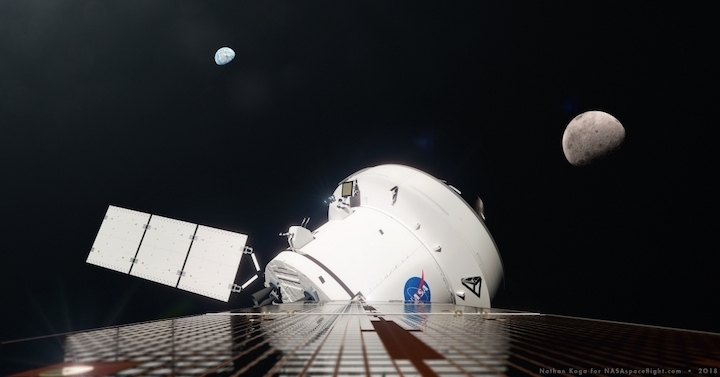 The EFT-1 Crew Module shortly after mate to the simulated Service Module structure in June, 2014, in the FAST cell. The EM-1 modules will be mated and closed out in the same cell for a trip to Plum Brook Station for thermal vacuum and EMI testing later this year. Credit: NASA/Kim Shiflett. Schneider noted that all the functional testing on the Crew Module and Service Module before they are joined limits the testing necessary post-mate. “We try and test as much as we can at the module level and so by the time we get to the FAST cell the only things that we really need to test are the new interfaces,” he said. “We’ll do a high-level, general functional test prior to shipment to Plum Brook and then we’ll do the same thing after receive up there,” Wilson added. The combined Crew and Service Module (CSM) will be transported to Plum Brook for thermal vacuum (TVAC) and electromagnetic interference/compatibility (EMI/EMC) testing. The spacecraft will be powered for the tests. “One of the things you want to do in the first thermal vacuum cycle we call it a thermal balance test and the idea is to figure out the equilibrium point of the spacecraft thermally and then you’re going to run the spacecraft itself because it’s both generating heat and radiating it at the same time so you want to make sure those systems are working,” Wilson explained. 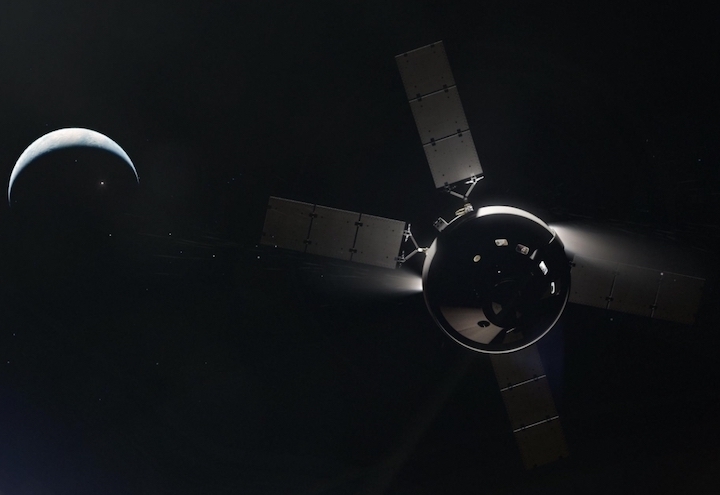 Animation depicting the EM-1 Orion spacecraft after receiving in the Assembly High Bay at the Space Environment Complex at Plum Brook Station. The spacecraft is oriented horizontally transport to Ohio, then rotated to vertical for testing. Credit: NASA Glenn Research Center. Without its solar array wings, the spacecraft’s power distribution system will get its power generation from the EGSE used at Kennedy. “That same ground support equipment that we use at KSC in the O&C to simulate the solar arrays like the way we are during the power-on testing right now, we’ll use that same rack of equipment up there and it basically simulates the power generation of the solar arrays and feeds it into the same connections on the spacecraft,” Wilson said. “We have to run the active thermal control loops while we’re in there so all that stuff that we have here, we move to Plum Brook with the vehicle,” Schneider also noted. Orion and its associated ground support hardware will be transported back to KSC after the Plum Brook tests, where Lockheed Martin will install the remainder of the CSM hardware and closeout the spacecraft for launch. Lockheed Martin will then turn the spacecraft over in the O&C Building to EGS for launch processing. 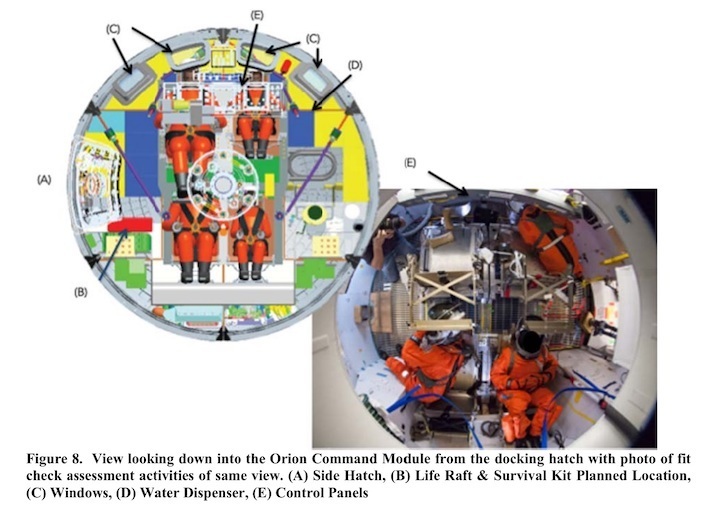 The Crew Module is built around the pressure vessel that is the living and working area for Orion crews. The Exploration Mission-2 (EM-2) module recently completed its proof pressure test in the Operations and Checkout (O&C) Building at the Kennedy Space Center (KSC) in Florida, following installation of additional hardware to fill out its primary structure. 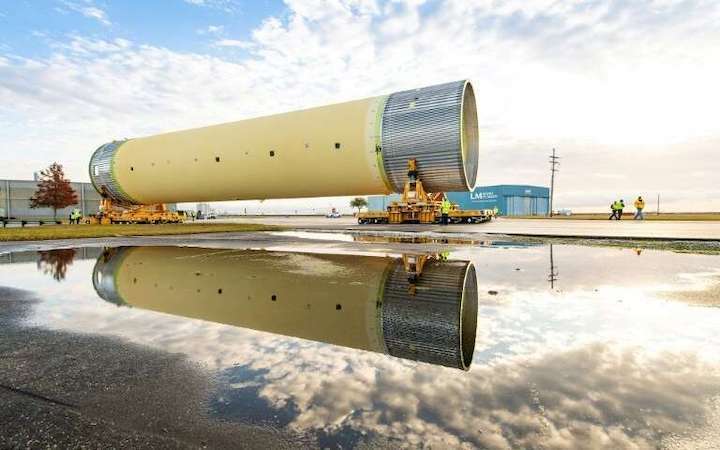 Crew Module pressure vessels are welded from seven structural components at the Michoud Assembly Facility (MAF) in New Orleans. The EM-2 article was completed in August and arrived at the O&C Building on August 24. “We got the shell from Michoud, it went into our assembly jig, the famous birdcage, we put all the primary structure on that’s required for proof test, did the proof test,” Schneider noted. The secondary structure installation for the Crew Module is lengthy. “The crew module has literally hundreds of secondary structural elements and I’m not talking two-hundred, I’m probably talking closer to five-hundred so it takes a while,” Schneider noted. Once structural assembly is completed, the module will go into the clean room where the tubing for the different fluid systems is attached and welded together. “I think we’re supposed to go into the clean room in the Summer, like July or something,” he added. The tube welds will then be proof tested and leak checked and then technicians will begin integrating the core set of avionics and electrical systems to do an initial power-on (IPO) of the Crew Module. 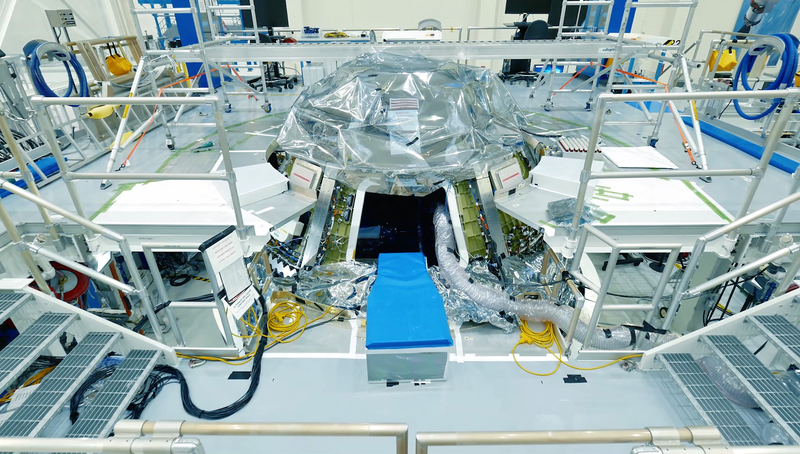 “When you come out of the clean room, you start putting in all the avionics boxes because you want to get into initial power-on,” Schneider said. A second set of core avionics boxes was ordered to help with the EM-2 processing schedule. Although EM-1 spacecraft assembly is nearing completion, delays in launch mean it could still be almost two years off which could start impacting the assembly and test schedule for EM-2. “I think the reason we went ahead and ordered the second set of core avionics is because we wanted to get to IPO as quickly as we can and I think we wanted to decouple IPO with the EM-2 CM from the EM-1 flight,” Schneider said. 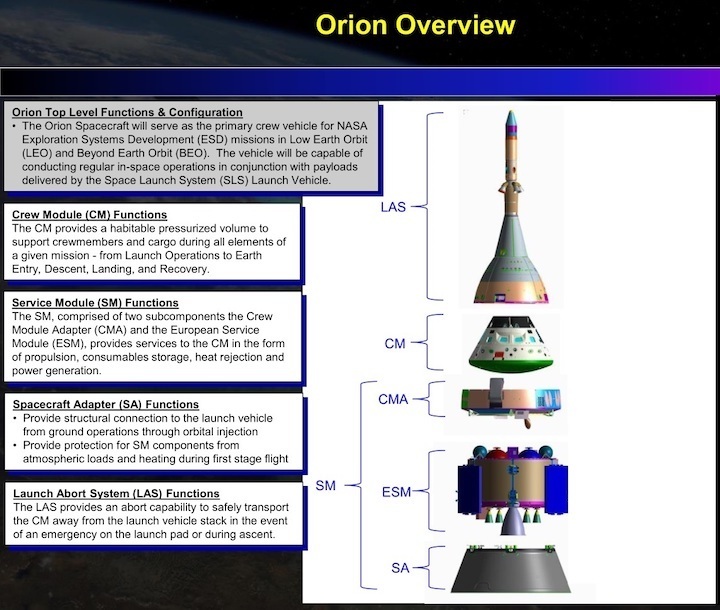 The major, in-space elements of the Orion spacecraft are the Crew Module and Service Module, with the latter divided into a Crew Module Adapter (CMA) and European Space Agency (ESA) Service Module (ESM). 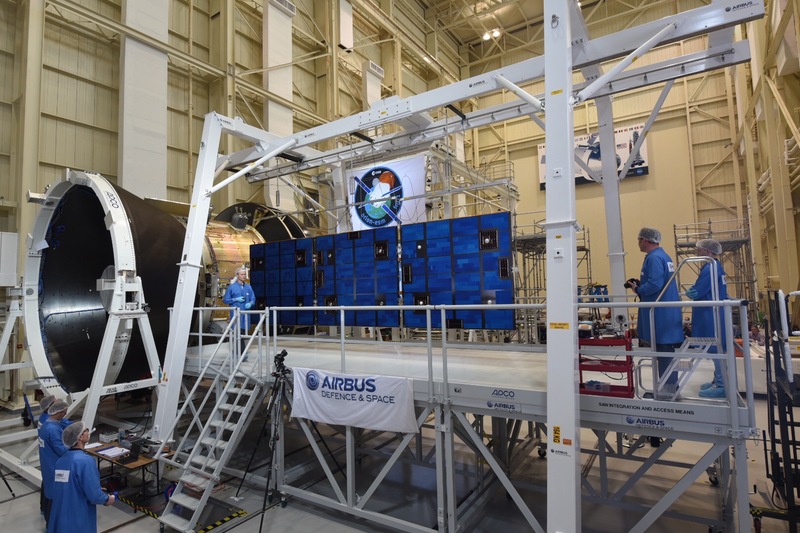 Lockheed Martin is the prime contractor for the Crew Module and CMA; Airbus Defence and Space is the prime contractor for the ESM. The Crew Module and Crew Module Adapter elements are delivered as essentially bare metal structures that Lockheed Martin assembles and integrates into working spacecraft modules in the O&C Building at KSC. The ESM is assembled and integrated by Airbus in Bremen, Germany. The ESM is then transported to KSC for final assembly, first with the CMA and then with the Crew Module, a process the Orion assembly team is currently going through with the EM-1 spacecraft. In parallel, EM-2 spacecraft assembly work is going on in adjacent work areas in the O&C. EM-2 is the third and final development flight for Orion during the current Design, Development, Test and Evaluation (DDT&E) phase of the program. The crewed test flight planned for 2022 will make a long, high Earth orbit before looping around the Moon and returning. The first Exploration Flight Test-1 (EFT-1) mission launched a working, but uncrewed version of the Crew Module with mass simulators for the Service Module elements. The EFT-1 Orion flew two Earth orbits, remaining attached to the Delta 4 Heavy upper stage until shortly before re-entry. EM-1 is the second test flight, which adds a working Service Module to a second generation Crew Module. NASA is still hoping to launch that flight by the end of 2020; Orion will make its first solo flight, going into Lunar orbit for a half or one and a half revolutions before returning to Earth. The spacecraft configuration for EM-2 adds all the equipment and additional supplies to support a four-person crew for up to twenty-one days on a standalone mission. “The main difference between EM-1 and EM-2 is just that, it’s really the crew interface and the suit interface,” Schneider said. A fully functioning Environmental Control and Life Support System (ECLSS) will be integrated for the first time on EM-2; in addition to waste management, there are systems for (among other things) air revitalization, fire detection and suppression, and cabin pressure and temperature management. Displays and controls for the crew to monitor the vehicle and also command and control operations when needed will be installed on EM-2, along with space-to-ground communication systems and seats used during dynamic phases of flight like ascent and entry. Additional avionics boxes and software functionality are also being integrated into Orion’s computer systems on EM-2 to support the crew. “So when you do that you put the longerons up against it, locate it using the laser, you know lasers to shoot it in, and then the drilling I think we’ve already begun the drilling of four of the longerons,” Wilson added. The inner ring structure was redesigned from a set of composite panels to a single, machined piece of metal for EM-2. “The reason we call it the Crew Module Adapter is because it’s got all the interfaces between the Crew Module and Service Module so the umbilical frames, the ground umbilical is also in the CMA so you got frames that attach to ground umbilical plates,” Schneider explained. The CMA will go through an outline of work similar to the Crew Module. “It’s not quite as long because it’s not as big and complicated — it doesn’t have as many components as the Crew Module does,” Schneider noted. 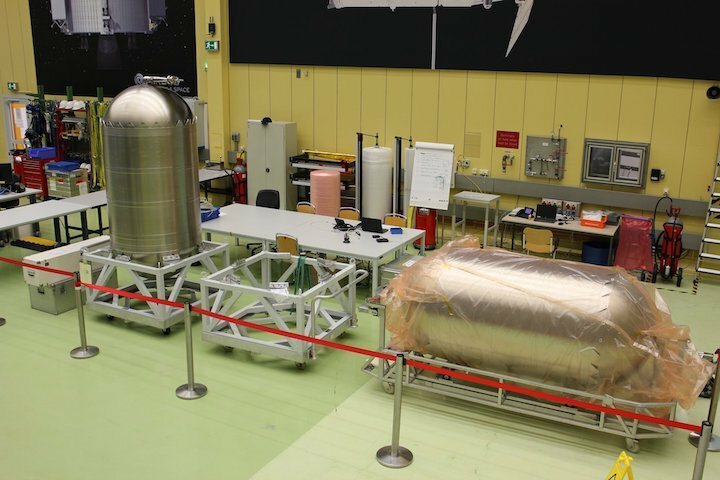 Meanwhile assembly, integration, and test of ESM Flight Model-2 (FM-2) continues in Bremen. Airbus recently posted a photo marking the arrival of two of the large hypergolic propellant tanks there. In a major shift in direction, NASA wants to give the first mission of the Space Launch System (SLS) to commercial rockets, Administrator Jim Bridenstine said Wednesday. “The goal is to get back on track,” Bridenstine told a Senate committee. 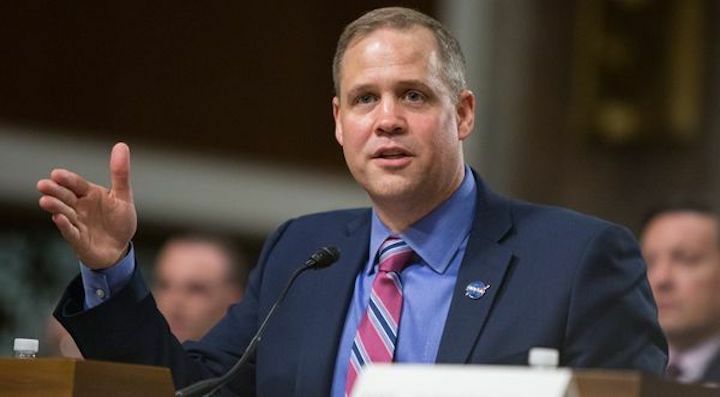 Bridenstine said NASA found out last week that SLS faces another delay from the original plan to launch for the first time in 2020 on a flight called Exploration Mission 1 (EM-1). The rocket’s development is being run by NASA’s Marshall Space Flight Center in Huntsville. NASA is now studying whether to send its first Orion crew capsule and first European Service Module into space on a big commercial rocket, “launch a second heavy-lift rocket to put an upper stage into orbit around the Earth and then dock those two together to throw around the moon the Orion crew capsule with the European Space Module,” Bridenstine said. “This is 2019,” Sen. Roger Wicker (R-Miss>) interjected, laughing. “Yes, sir,” Bridenstine replied. “Here’s the glory of the US of A. We have an amazing capability that exists right now that we can use off the shelf to accomplish this objective.” He apparently was referring to 2014, when a Delta IV Heavy rocket built by United Launch Alliance in Decatur, Ala., launched a test Orion capsule on a four-hour experimental trip around Earth. Bridenstine said SLS remains “a critical piece of what the United States needs to build,” because of what it will be able to lift. 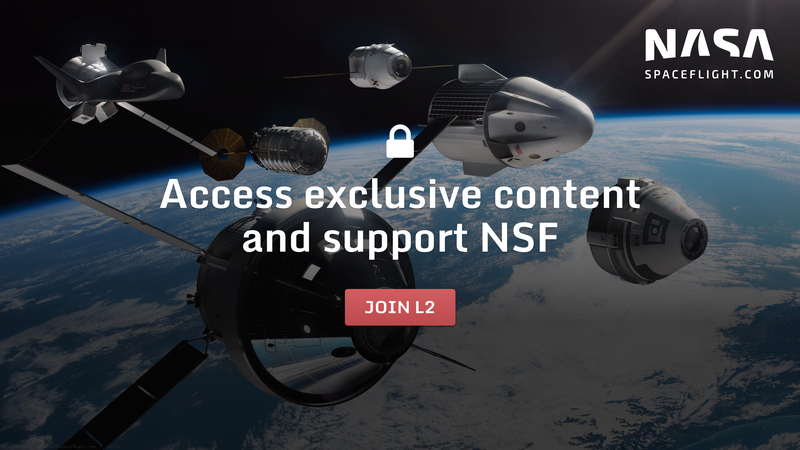 But the agency is just now “understanding how difficult this project is and that it is going to take some additional time,” he said, adding that second launch of Orion with a crew should still belong to SLS.